The lumbar nerves are five spinal nerves which arise from either side of the spinal cord below the thoracic spinal cord and above the sacral spinal cord. They arise from the spinal cord between each pair of lumbar spinal vertebrae and travel through the intervertebral foramina. The nerves then split into an anterior branch, which travels forward, and a posterior branch, which travels backwards and supplies the area of the back. The middle divisions of the posterior branches run close to the articular processes of the vertebrae and end in the multifidus muscle. The outer branches supply the erector spinae muscles. The nerves give off branches to the skin. These pierce the aponeurosis of the greater trochanter. The anterior divisions of the lumbar nerves (Latin: rami anteriores) increase in size from above downward. The anterior divisions communicate with the sympathetic trunk. Near the origin of the divisions, they are joined by gray rami communicantes from the lumbar ganglia of the sympathetic trunk. These rami consist of long, slender branches which accompany the lumbar arteries around the sides of the vertebral bodies, beneath the Psoas major. Their arrangement is somewhat irregular: one ganglion may give rami to two lumbar nerves, or one lumbar nerve may receive rami (branches) from two ganglia. The first and second, and sometimes the third and fourth lumbar nerves are each connected with the lumbar part of the sympathetic trunk by a white ramus communicans. As the nerves travel forward, they create nervous plexi. The first three lumbar nerves, and the greater part of the fourth together form the lumbar plexus. The smaller part of the fourth joins with the fifth to form the lumbosacral trunk, which assists in the formation of the sacral plexus. The fourth nerve is named the nervus furcalis, from the fact that it is subdivided between the two plexuses. The first lumbar spinal nerve (L1) originates from the spinal column from below the lumbar vertebra 1 (L1). The three terminal branches of this nerve are the iliohypogastric, ilioinguinal, and the genitofemoral nerves. The second lumbar spinal nerve (L2) originates from the spinal column from below the lumbar vertebra 2 (L2). The third lumbar spinal nerve (L3) originates from the spinal column from below the lumbar vertebra 3 (L3). The fourth lumbar spinal nerve (L4) originates from the spinal column from below the lumbar vertebra 4 (L4). The fifth lumbar spinal nerve 5 (L5) originates from the spinal column from below the lumbar vertebra 5 (L5). 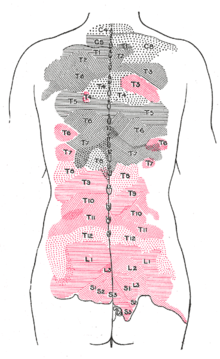 Areas of distribution of the cutaneous branches of the posterior divisions of the spinal nerves. The areas of the medial branches are in black, those of the lateral in red. Lumbar spinal nerves.Deep dissection. Posterior view. Hsu, Philip S., MD, Carmel Armon, MD, and Kerry Levin, MD. "Lumbosacral Radiculopathy: Pathophysiology.Clinical, Features, and Diagnosis." www.uptodate.com. Uptodate, 11 Jan. 2011.Web. 26 Sept. 2012. http://www.physiologie.uni-mainz.de/physio/mittmann/ThalFallZ3.pdf. This page was last edited on 24 March 2019, at 16:38 (UTC).